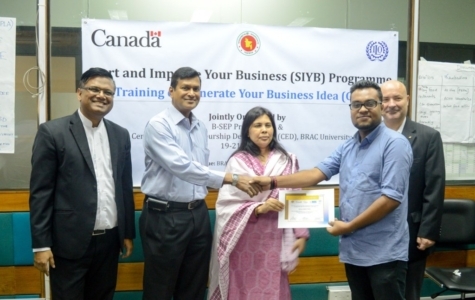 Centre for Entrepreneurship Development (CED), BRAC University (BRACU) and International Labour Organization (ILO) jointly organized a 3-day training titled â€œGenerate Your Business Ideaâ€ (GYB) as a part of the â€œStart and Improve Your Business (SIYB) Programmeâ€ under the â€œBangladesh Skills for Employment and Productivityâ€ (B-SEP) project being implemented by the Government of Bangladesh and ILO. The training was organized during 19-21 May 2016 at CED premises in BRAC University with the aim to provide the aspiring Bangladeshi youths and/or potential entrepreneurs with necessary skills to generate their business ideas efficiently and structure bankable business plans successfully. Mr Ferdous Ahmed (Certified SYIB/GYB Trainer, and Chief Executive Officer, SIYB Trainers Forum) acted as the â€œLead Trainerâ€ of the training program, whereas Dr Rubina Husain (Managing Director and Centre Head, Institute of Hotel Management and Hospitality), Mr K M Hasan Ripon (Chief Executive Officer, JOBSBD), and Mr Syed Maruf Reza (Associate Professor and Head, Dept. of Entrepreneurship, and Director Career Development Center, Daffodil International University) were the trainers of the program. The participants of the training consisted of BRACUâ€™s current students and alumni, and the incubatees of the Business Incubation Centre (BIC) under BRACU, as well as professionals from various reputed financial, research, academic and commercial organizations such as icddr,b, Branding Bangladesh, RAK Group, Corporate Ask, Dutch Bangla Bank Limited (DBBL), Synchronous ICT, Military Institute of Science and Technology (MIST), Expressions Ltd., Arash Power and Automation Engineering, etc. 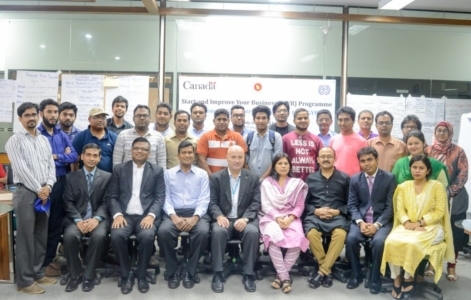 At the end of the training, a certificate giving ceremony was also organized where Mr Cezar Dragutan (Chief Technical Advisor, B-SEP Project â€“ ILO Dhaka) was the Chief Guest. Mr Francis De Silva (Senior Specialist, Industry Skills Development, B-SEP Project), Ms Fahmina Kashem (established entrepreneur) and Ms. Afshana Choudhury (Sub-Project Manager, Establishing a Business Incubation Centre for Graduate Student, HEQEP, and Program Manager, CED, BRAC University) were also present at the event.